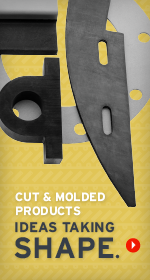 Custom and molded parts that cut it … no matter what the job! At Apache, ideas turn into solutions. We work with you to develop high-quality, cost-effective, cut and molded parts. Our product and engineering staff are here to help, working to raise the bar and partnering with you to move your business forward. Product specialists and engineering personnel are available to assist you in selecting the right materials and production process to best fit your application. Whether it is a prototype, low or high volume production run, or blanket order program, we provide high-quality products at competitive pricing. We fabricates all types, sizes and quantities of custom cut parts to your exact specifications. Our locations stock a wide variety of standard and specialty materials and compounds, and with locations across the US provides our customers with better response and service time.